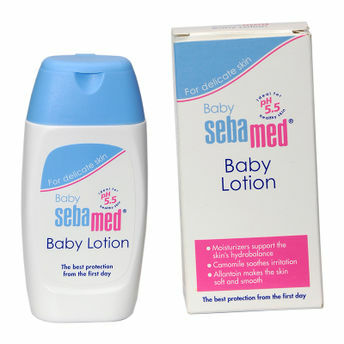 The Sebamed Baby Lotion deeply moisturizes baby's skin, helping to protect them from skin conditions at an early age. The best baby skin care begins with pH-balanced barrier support and that's exactly what our specially formulated Baby Lotion provides. Made to gently moisturize your child's delicate and developing skin, this lotion helps to guard against dry skin and skin problems such as psoriasis and diaper rashes. Apply a generous amount after bathing to seal in moisture and keep your baby feeling snuggly and soft. It helps to guard against dry skin and skin problems such as psoriasis and diaper rashes. Explore the entire range of Lotions & Creams available on Nykaa. Shop more Sebamed products here.You can browse through the complete world of Sebamed Lotions & Creams .Alternatively, you can also find many more products from the Sebamed Baby Lotion range.